I still meet people who are surprised I am Pagan. Not necessarily because it is unusual to encounter a Pagan given our small numbers (even though our ranks are growing), but because I don’t present myself as a stereotypical Pagan. Though I find the concept of a stereotypical Pagan funny because few Pagan resemble it — that I’ve met anyway. 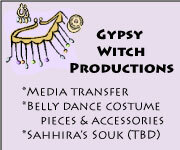 But there is a stereotype of Pagans as witches (either light or dark), druids, or some other distinct group that wears robes or flouncy clothes. I think this happens mostly because people who aren’t Pagan hear “Pagan” and imagine us wearing garbs reserved for observance. Of the stereotypes, several fall into what I call the “Mokey” category. 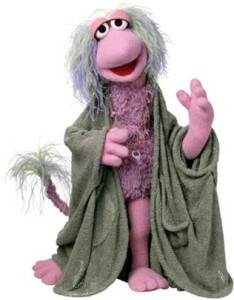 A lot of people who aren’t Pagan hear “Pagan” and conjure an image akin to Mokey from Fraggle Rock. I *heart* Fraggle Rock and I *heart* Mokey. I also dress like her some of the time. But not most of the time. Most of the time, I am very aware of my presentation of self and very purposeful about that presentation being polished. I confess, I am a fashionista. I like to look professional and fashionable (professionable?) for work, and I like to dress to the nines when I go to special events. It’s not just that I like to look good, I value looking good. I am also a material girl. In the end, I know material things do not matter and I don’t hold such things above relationships. But I like having nice things. I’m not sure I would say I value having nice things. If I can’t afford something or have to do without…whatev…it is what it is. But I do want nice things. I want to be pretty and I want to have pretty things. I am a princess, damn it! Oy! I can almost feel Mokey looking at me with her sad eyes and shaking her head (like the eyes of T.J. Eckleburg in “The Great Gatsby”). You may be asking, “So what, GG? What’s the big deal?” And you’d be right in asking that question. I am not sure it is a big deal. I mean, this doesn’t make me a bad Pagan, does it? I wonder sometimes. Sometimes, I think more about my wardrobe than I do about wyrd. I probably chose my shoes as carefully as I chose pieces for my ancestor altar. I can spend as much time talking about my design choices as I can about my faith choices. Geez. This sounds really bad (and shallow) in confession form. *sigh* I don’t really feel a need to change. It’s just that sometimes I don’t feel like an authentic Pagan, like maybe I’m doing it wrong. Sometimes I think my desire for things may be keeping me from doing it right. Featured image, advertising shot from the Sergio Valente loading page. These were there perfect jeans I drove 90 miles for, but never found. I do advise though, to pagan buying lots on make-up or clothes, to be careful as much as they can regarding how they dispose of the purchases and to try a more earth-friendly version when it is given. And also to try to see how they can limit them. I mean . . . seven bathing suits when you swim twice a year is not only a loss of money, it’s also asking too much from Gaia. And your final point is well taken. I am thoughtful about my groceries, my dining-out choices, and my facial products (I use Arbonne), but I haven’t been good about considering the environmental consequences of my clothing purchases. I will start thinking about that, too!